If you are looking for current models, there are nineteen available Under Armour shoes for boys from their website directly. 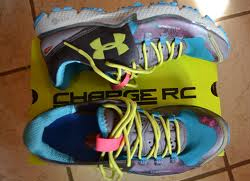 Under Armour has a proven track record in creating high quality products with great value. In order for your boys to perform on the playground, field, or in their team sports the best they can, you should put them in these quality, Under Armour shoes for boys. Boy’s Split Infant running shoe – give your young one the best shoe for running and burning off all that energy. Boy’s Infant Assert - Infants alike will love these shoes with extra comfort and durability. Boy’s split Pre-School running shoe – durable and cushioned, let your preschool run with the best of them during play time. Boy’s Strive Preschool training shoe – your son can train with the best “little” leagues, with these supported training shoes with extra cushion and stability. Boy’s Assert Preschool running shoe – these give your preschooler lightweight running support which enhances their natural foot-strike. Boy’s Micro G Funk grade school basketball shoe – to improve your son’s game on the basketball court. Boy’s Impulse grade school running shoe – for maximum support and cushioning with all sports that require running or general running. Boy’s Strive grade school running shoe – with an extra solid, non-marking sole, these provide extra outdoor strength and stability for multiple training purposes. Boy’s Micro G Split grade school running shoe – great for running, with HeatGear fabric for extra moisture control. Boy’s Playmaker II Slide shoe – a soft, comfortable slide on shoe made with a suede strap. These are great to wear before and after game time. Boy’s Rally II Slide shoe – comfortable flop shoes for in between the home and field. Boy’s Micro G Quick II grade school training shoe – keep your athlete training hard with a flawless blend of synthetics specially engineered for maximum support and breathability. Youth Blur Challenge FG soccer cleat – great for your soccer player, providing the ultimate lightweight support and structure. Boys Yard II Jr. R.M – baseball players get extra protection and strength with cushion, shocks, and less foot slippage. Boy’s Crusher III Football Cleat – made for the football star, with extra stability and comfort. Hammer III Youth Football Cleat – the field is no match for your son, giving him extra support and comfort beyond compare. Youth Blur HG Jr – Triumphant at the soccer match, your son will enjoy these comfortable, yet durable, shoes with great traction. Youth Force FG Soccer – these great soccer shoes are built to reduce the cleat pressure and optimize support and shock absorption, ensuring your soccer star enjoys the match even more than you do.